JERSEY BOYS returns to Chicago. 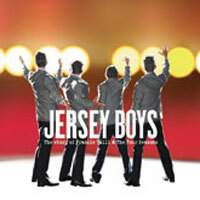 JERSEY BOYS is the story of Frankie Valli and The Four Seasons: Frankie Valli, Bob Gaudio, Tommy DeVito and Nick Massi. This is the story of how a group of blue-collar boys from the wrong side of the tracks became one of the biggest American pop music sensations of all time. They wrote their own songs, invented their own sounds and sold 175 million records worldwide - all before they were thirty. "...�Jersey Boys� now has closed on Broadway and the show you can see at the Auditorium � which was packed on Tuesday night � is greatly reduced from what has played in Chicago before. The road business is structured this way � by eliminating costs and cutting musicians and having each actor do more, the show can play smaller markets like, say, Youngstown, Ohio or Danville, Kentucky, where the show now is headed." "...Jersey Boys never shies from showing the price behind the chart busters (175 million records sold worldwide!) and the differences among the scarlet jackets. I wish it spent more time, as did The Buddy Holly Story, with showing us how they made the music. But when we hear Wexler�s boyish, irrepressible and incandescent �Can�t Take My Eyes Off of You,� we�re present at the creation. Everything old is new again and now three golden oldies (alas, Nick Massi is no longer alive) are Jersey boys once and forever." "...It is a story filled with the trials and tribulations of the times and the business of � recording�. Songs like �Big Girls Don�t Cry�, �Oh What a Night�, �Walk Like A Man�, �Can�t Take My Eyes Off of You�, �Sherry� and�Working My Way Back To You� are not only performed to our delight, but we get a little insight to the creation of these songs." "...There�s so much to love in this returning National Tour of one of Broadway�s most kinetic, best-written and slickly-produced musicals. The show offers a talented cast telling the backstory of this internationally favorite musical group, whose falsetto lead singer and closely blended harmonies made the Four Seasons so unique. The musical�s pumping, brassy musical accompaniment recreates their signature sound and keeps toes a-tapping. This joyous, powerful, heartfelt biographical song fest is sure to bring audiences to their feet clapping, dancing and singing along. It�s a not-to-be-missed spectacle and �Oh, What a Night!�"
"...The current national tour of "Jersey Boys" is stopping at the Auditorium Theatre for a paltry eight performances. This might be the final Broadway caliber staging of the musical to play Chicago before it enters the domain of regional theaters, so patrons should seize the moment. This is a terrific production and we may never see its like again." "...The book, �Jersey Boys,� was written by Marshall Brickman and Rick Elice. Amusing dialogue is interspersed with the tremendous songs that keep the audience laughing." "...If you�ve never seen Jersey Boys before�and even if you have�you�d be doing yourself a favor to get down to the Auditorium this week for this excellent production, which unfortunately stays in Chicago such a short time and then it�s �Bye Bye Baby.�"
"...Most will likely agree�it�s all about the music! How could it not be? If you grew up listening to The Four Seasons on your transistor radio so much that it was just part of the ether-- this is your show. Sherry, Big Girls Don�t Cry, Walk Like a Man, My Eyes Adored You, C�mon Marianne, Can�t Take My Eyes Off You, and more�the only thing missing to transport you back to your wonder bread years (or teens, for the older boomers) is ..well�the British Invasion."